**Includes Cabinet, 1/3 HP Motor and Speed Control, completely assembled and ready for operation. This is the basic machine of the Levin line, an extremely accurate and sensitive lathe designed to meet the most exacting demands necessary in machining miniature and microminiature parts. It is the standard for toolrooms and mechanical laboratories requiring the most modern facilities for producing small parts involving delicate operations with extreme accuracy. With proper tooling, these lathes make it possible to manufacture parts which would otherwise be difficult or impossible to fabricate on larger lathes. The Instrument Lathe can be equipped with appropriate tooling for use as a Toolmakers' Lathe, Turret Lathe, Micro-Drilling Machine, or where indicated, it can be tooled up so as to perform the functions of all three types. These lathes can be ordered as a simple lathe without any bench, cabinet or drive unit; they can be obtained mounted on a Formica-top bench, or cabinet. Regardless of the mounting or drive, the basic machine is the same. HEADSTOCK - The headstock is fully enclosed with special precision preloaded angular contact ball bearings. The front bearings consist of a preloaded pair of angular contact bearings with a single radial bearing in the rear. The spindle is fully hardened from end to end. On headstocks using Type 3C collets, the headstock is furnished with a special adapter and drawbar assembly which enables one to use the more accurate and sensitive Type D collets for holding work under 8.0 MM diameter. TAILSTOCK - The tailstock is lever operated through a sensitive rack and pinion feed system. The spindle is fully hardened from end to end and accepts all Type D collets. It is supplied with a Micrometer Stop having 0.0005" dial graduations. A cam lock device on the tailstock permits locking the spindle rigidly in any selected position. LATHE BED - The lathe bed is cast from Meehanite and has fully ground precision ways. It has an overall length of 18 3/4" and is furnished complete with a T-Bolt, Nut and Collar assembly for attaching tooling. Pedestals are integrally cast with the bed and a T-slot is provided throughout the length of the bed ways. MOTOR DRIVE UNITS - Three standard drives are available for these lathes. A separate 1/8 HP variable speed drive is available for a rear bench top mounting configuration where high torque is not essential. Lathes furnished on Formica-top steel benches and lathes furnished on steel cabinets are supplied complete with a 1/3 HP SCR drive having IR drop compensation. All drive units provide infinitely variable spindle speeds from 0 to 5000 RPM with dynamic braking, foot switch start and stop, and full overload protection for use on 115 V, 60 Hz, 1 Ph AC electrical service. CHIP TRAY - A Stainless Steel chip tray with coolant drain is included with all bench-mounted lathes, and is available at extra cost for lathes ordered without a bench or cabinet. COOLANT SYSTEM - An optional coolant system is available for use with these lathes. The electrical system of each motor drive unit is pre-wired at the factory to accept a standard Levin coolant system. An independent control switch on the control unit permits simultaneous operation of the lathe and coolant system when the foot switch is depressed. 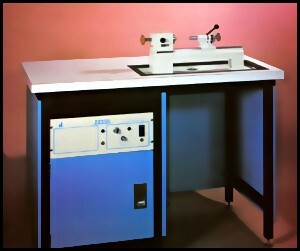 CABINET - The cabinet provides the best possible support for the Instrument Lathe. Convenient access to all storage compartments has been provided with doors at the front and rear of the cabinet. The entire coolant system can easily be removed for thorough cleaning whenever required. All necessary wiring for both the coolant system and drive control are included with all machines on a cabinet.